Grant Wiggins made a lot of waves yesterday with a post the ASCD blog The Edge in which he calls for banning the reading of fiction in schools in order to encourage boys to read and help students improve nonfiction reading skills. He says he wrote meaning to provoke, and he certainly did. The blog doesn’t provide a means of linking to comments, but I felt a voice of reason in those comments was Estelene Boratenski. She’s right in pointing out that people listen to Wiggins, and it wasn’t clear that he was writing in the spirit of A Modest Proposal. I don’t have a lot to add to the public outcry. If you have read any of my archives, you know I’ve long been a proponent of backward design. It just makes sense pedagogically. Wiggins and writing partner Jay McTighe wrote about backward design in Understanding by Design, which remains the single most influential professional reading I’ve ever done. Wiggins was very kind to my readers and to the participants at the UbD Educators wiki. For a short period of time, I blogged with Grant at a now-defunct group blog about educational matters. I have the highest respect for Grant Wiggins. I also have the highest respect for fiction’s ability to teach us about who we are. I think one thing we need to do to engage boys in high school reading is to offer them choices, but one cannot generalize that boys necessarily like nonfiction more than fiction, and I have known boys who have enjoyed reading such fare as Wuthering Heights, Beloved, and The Scarlet Letter. I think a lot of fiction isn’t taught in a way that necessarily grabs boys, and that’s where backward design comes in. It gives the literature teacher a hook—an issue the novel grapples with that makes for interesting discussion. It is for this reason that one of the essential questions that frames discussion in my classroom for the year in my British Literature and Composition course is How do our stories shape us? How do we shape the world around us with stories? I wouldn’t argue that we currently incorporate enough nonfiction into our curricula. I think nonfiction is important. I also don’t quibble with the idea that we need to do something to get boys to read. Guys Read is on to something there, I think. I also don’t argue about the fact that we need to examine the choices we make in terms of what books are taught. But I don’t think throwing fiction out the window is the solution. That, to me, seems to be the best reason to teach fiction. Part of what really angered me about that post was the gender stereotyping. Boys need stories. Often these stories involve action or fantasy or realism or characters that grow – which is essentially what girls want as well. Narratives are how we make sense out of the world. Why do you think so many kids, bored to death of expository passages, yearn for video games? The thing about fiction, at least decent fiction, is it will include persuasive, expository and occasionally functional text within it. He seemed to miss that as well. I would have to agree. He said in the comments that he was attempting a sort of Modest Proposal argument, but I think Estelene Boratenski did a good job explaining why it didn't come off that way. I didn't read the original article, but I'm with John above about the gener stereotyping. "Boys" is an awfully big category of people and it seems nearly impossible to theorize what needs to be done in order to get "boys" to read — or indeed if anything needs to be done. When I was a kid I loved to read fiction, even poetry, and I wasn't alone among the guys I ran around with in high school. And I've got a 2-year old son who is constantly shoving books into my face for me to read to him. Are we outliers in a larger statistical group? Maybe, but as you mentioned, radical solutions don't seem to be the answer. They certainly don't help outliers! I agree, Robert. It's a pretty broad brush. And there are so many reasons why people don't read it seems impossible to blame it on a dearth of nonfiction. My son and husband love books, too. So does my dad. I don't think you're outliers. True reaction from a very male student in my class on the first day of our sonnet unit: "We're studying sonnets today? YES!" Dana, I haven't read the Grant Wiggins post, but after reading yours, feel I don't have to. I remain absolutely flabbergasted at the basic and unintellectual manner with which really smart people address the issue of boys and their reading. You, on the other hand are touching a point that remains for me the only one to make about reading in general- what's being read HAS to be a good story. We must get past gender stereotypical perspectives on what boys like to read, and simply ask them what they like to read. Your essential question, "How do our stories shape us? How do we shape the world around us with stories?" 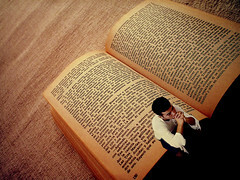 is brilliant in addressing the desire to read, and that desire MUST follow a sense of intrigue about the content. We all have a story, and that story intertwines with everyone else's story- it's the quantum reality of our exixtence- call it six degrees or whatever you want, it's real, and the really excellent authors have unlocked the secret into transferring this quantum reality to the written page- they make us feel like we are experiencing the text first-hand. In school, why not dwell on the actual first-hand stories that all of us can tell? Perhaps this will lead to the desire to hear the stories of others. Personal relevance is a necessary element in any fiction reading. If we could tell and hear each other's stories, then write them down, it would give us a sense of the wonder behind good experiential writing (the kind we all do best) and encourage us to read beyond our class or circle of friends. The oral tradition ash a role to play also… First we share, then we write. The intrigue behind a "Dead Poet's Society" type of story circle in an English classroom is captivating to even the most withdrawn latent writer. My time teaching with First Nations people taught me that stories are very valuable teaching and learning tools, and that even the most boring of subject matter can be wrapped up in a really good story as a vessel to drive the concept. Call them legends, fairy tales, fables, whatever… we need to get back to a story-based focus in teaching, and not just in English class. Sorry for the diatribe, but you're on to something IMO. Everyone has a story- I'd be honored if you considered my POV at http://bit.ly/hjy7ou. Merry Christmas to you and yours, cheers! I haven't read Wiggins' post, but after reading yours, I don't have to. I continue to be flabbergasted at the unintellectual manner in which really smart people approach the issue of boys and reading. You, on the other hand are on to something I feel very strongly about. The essential question you refer to, "How do our stories shape us? How do we shape the world around us with stories? "- is key in unlocking a desire to read in anyone, not just the stereotyped "challenged" boys among us. Why not start with the most relevant stories we all possess, our own? Before we write them down, the lost oral tradition ash a giant anticipatory role to play here as well. My time teaching with First nations people taught me that even the most boring of subject matter can be wrapped interestingly within a good story; the vessel used to make things relevant and engaging. Call them legends, fables, fairy tales whatever… everyone likes a good story. Creating "Dead Poet's Society" like story circles in our classrooms would create the intrigue and context for each of us to tell our stories, and to learn appreciation for those of others. Telling and hearing good stories is a prelude to writinjg and reading good stories don't you think? I would be honored if you considered my perspective at http://bit.ly/hjy7ou. Thanks so much for this thought provoking post. Thanks, Sean. I'm sorry about my aggressive spam software. To visitors—Sean isn't repeating himself—it's my software's fault; however, because the comments contained some slightly different points, I thought you should see them both. Sean, I'll take a look at your post after Christmas. Thanks! I totally agree with you. My juniors just finished The Things They Carried, and the argument of value presented itself throughout discussion. The students struggled with the validity of O'Brien's book when they found out that much of the book was fiction. I argue "Why does it matter?" Doesn't the book teach readers about the effects of war whether it is fiction or non-fiction. There is truth in everything. Yes, it definitely makes me think of Hemingway's famous thoughts. I have read that Stephen Crane's portrayal of the Civil War was considered so convincing in his time that Civil War veterans swore he must have served with them.